In today�s world Internet has touched each and every aspect of life changing the way we work, communicate and live. But the major concern has been about the security and privacy of the data that is being exchanged via Internet especially when you are sending the sensitive information through it. Amongst many ways of securing data, encrypting the sensitive data is the most popular and effective way to have data security. 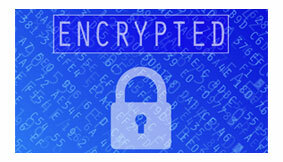 Encryption is translation of data into a secret code called a cipher text. Decryption is the process of decoding data that has been encrypted into a secret format this requires secret code or password. In Symmetric-key encryption technique single key is used to encrypt and decrypt the message. Encryption/Decryption is advisable while carrying out any kind of sensitive transaction, such as a online purchases or the communication of a company sensitive documents between different departments in the organization etc. Encryption of the data ensures its secrecy and/or privacy. E-Lock Digital Signature products and solutions enable users to sign the electronic documents digitally and encrypt them which assures the user of data integrity, confidentiality, security and non-repudiation of documents and transactions. E-Lock also provides the solutions which are PKCS#7 compliant and can be integrated with various online applications like e-tendering, e-banking imparting security to the data transactions online.